J Joyner in NE (02/01/16) - "We are very happy with the Prelude and Sureshine finish in our new interior. The painters complimented the advice they received from the folks that answered their questions about spray nozzles and how much to order. J & C Enck in KY (02/21/15) - "The Interior (Dark Honey) stain went on easy and made the logs look a lot better. After Sure Shine was applied it made a big difference, the logs were easier to wipe down and they looks so beautiful!" B Van Dyke in MI (06/24/2014) - "I like the coverage rate on this stuff. It goes forever. Really looks nice. I like the look of the gloss instead of the satin. Thanks for the free samples." 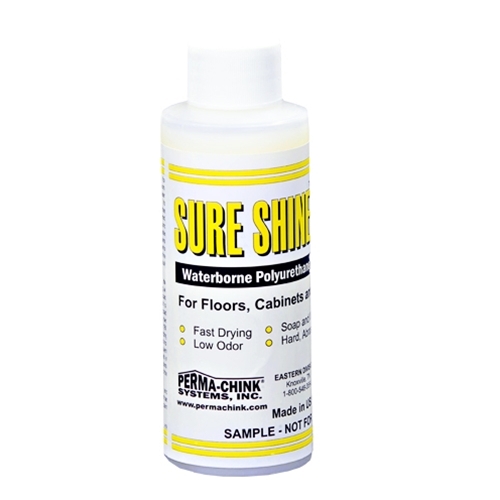 R Adamson in WA (10/15/14) - "I first applied SureShine to my hardwood floors 9 years ago. The first time was quite a project that involved removing the dull old finish. I used several coats of a mixture of satin & gloss. Each coat only took about 45 minutes to dry & be ready to apply the next coat. So the whole project only took about 2 days. Six years later I applied 2 more maintenance coats (more gloss than satin this time) in one afternoon. I love the easy soap & water cleanup and the lack of smelly fumes of oil finishes that sometimes drive you from your own home. The results with SureShine are spectacular. This finish is very durable & looks great. I would highly recommend it to anyone wanting to keep their wood surfaces protected with such a durable finish that also looks this great!." 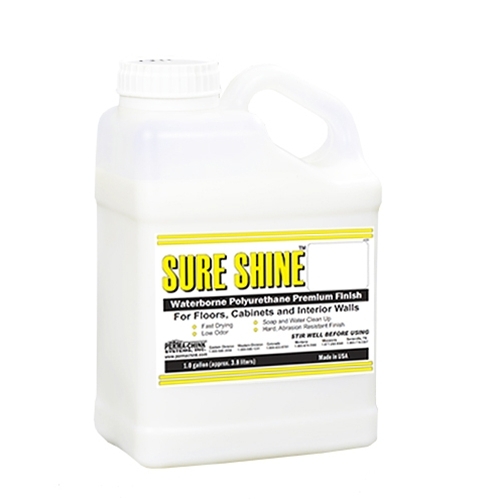 F Lundell in WI (04/09/2014) - "Sure-Shine is the only product I found to resist scuffing and scratches from my dog‘s claws." N Mauger in MI (12/05/2013) - "Wow was Sure-Shine easy to apply. No smell and I applied multiple coats in one day. Will review again after it has been on a while." 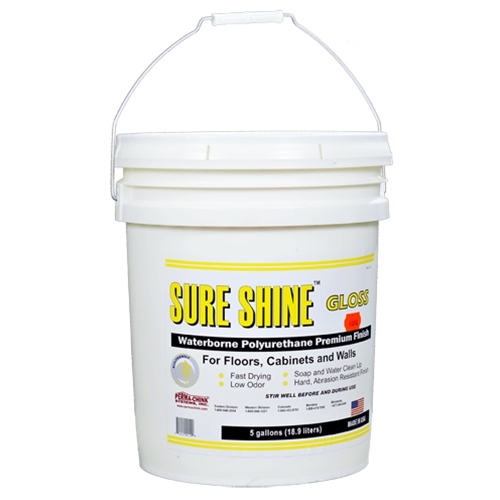 J Lindberg in NH (10/11/2012) - "I wanted my kitchen floor to have that Gym-Floor gloss…Sure-Shine provided that and more." S Tracy in PA (02/17/2011) - "I used Sure-Shine on my Interior beams, doors, and cabinets. What a durable finish"